I've been using it for faces - but my 8 y.o. picks it off no matter how tiny, ha! It's 12:30am here in Singapore. I went through yesterday's update and then went on to de links of your other fabbityfabfab ideas. I love your blog and I've seen all of your creations. Yesterday, I was cravin for your PlanetBox cos I think it's uber cool (I'm 24 and not a mother). Would love to get that box myself. Soon. (: and anw, just wanna say that my I-shall-look-at-happy-bentos-before-I-fall-asleep idea is soo worth it.. Cos it's PlanetBox!!! Really dying to get a Planetbox! It's so super cute! I have been loving your lunches.Does the planetbox mess up your cute creations,e.g cute cuts of cheese or nori?I am looking to purchase one for our son and thought I'll ask. The little bears are so cute! Thank you Melissa for replying! 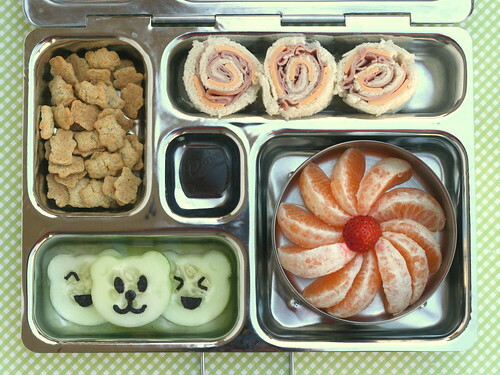 Your lunches are just too cute and your kids are so lucky to have a creative mom.Now,I'll look into the planetbox.Thanks again.